To get the best search engine results, you first need to develop a good long list of potential keywords to use on your Web site. After you brainstorm and research to come up with this list, the next step is to narrow it down to the keywords that will be most relevant and effective for Web searches. Search Engine Optimization/KSP: Bruce Clay, Inc. provides a free keyword tool. 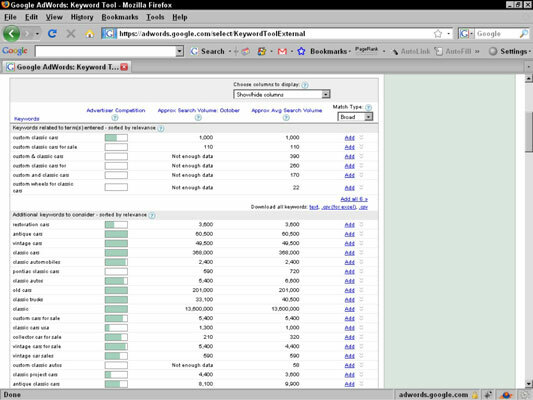 Simply type your keywords into the Keyword Activity search box. You’ll get keyword counts, plus demographic information. The following services are paid services, so you have to cough up a little bit of cash for them. They actually do research and check out your competition for you, so they might be something you want to invest in. That doesn’t mean you get out of doing the brainstorming and researching yourself; they just make it easier. SEOToolSet: In addition to the free tools offered by Bruce Clay, Inc, you can also subscribe to a full suite of fully integrated SEO tools. Far more robust than the free versions, the SEOToolSet is available for $39.95 a month. Wordtracker: This is a keyword tracking service that you have to pay for, but they do offer free trials. They offer an annual subscription of $369 U.S. per year. Keyword Discovery: Made by Trellian, this is another paid keyword tracking tool. You can subscribe for $49.95 per month. You need to cull the least relevant keywords off the list right away. If your business deals with customizing cars — but only American cars, not foreign ones — you can do away with words that refer to foreign-made cars. By doing this, you’re narrowing the focus a bit. When you’re clipping out keywords, remember that keywords that are supportive of a strong branding exercise, that result in sales more often than other keywords, or that have very high profit margins should all be retained. Using the keyword tracking tools, you can get rid of a bunch of irrelevant, low-traffic keywords right away and pick a good list to focus on. Remember, you’re not looking for five or ten keywords; you’re looking for hundreds of good keywords, depending on the size of your site. Although it might seem like a good idea to concentrate on the broadest, most general keywords out there, it’s actually not. What you want are keywords that give you conversion. A keyword that brings 60 visitors to your site, 10 of whom make a purchase, is much more desirable than a generic keyword that brings in thousands of visitors who only come in, blink, and then hit Back on their browser. Statisticians attribute this to the fact that people use generic keywords when gathering information, and more specific keywords when they’re ready to open their wallets.